Does Water Run Down a Slope to Your Property and Flood It? What are French drains? When are they useful? How do you install them? If your neighbor's land stands at a higher elevation than yours, you may be experiencing problems with excessive moisture on your property. Water from your neighbor's property may be running down the slope (just one of the challenges of landscaping on a hill) and spilling onto your property. You need better yard drainage. One option in such cases is installing French drains. When some people speak of a "French drain," they refer to a trench in which a drain pipe is laid; the trench is then filled in with gravel. But the traditional French drain (which is the type that this article explains how to install) is basically just a trench filled with gravel (no pipe). Also note that the term "gravel" is used differently in different regions. In this tutorial, "gravel" refers to an aggregate of small stones. But be sure your attempt at yard drainage will not adversely impact anyone else's land. Otherwise, installing a French drain could land you a lawsuit. Check your city codes before digging. Another preliminary step that could save you headaches later is checking with your local utilities concerning the whereabouts of underground cables and the like, so that you will know where not to excavate. There is a quick way to check: just dial the Dig Safe phone number. Locate the best area for a French drain. Find an area along the slope on your side of the property line where excavation would be easiest (that is, free of obstructions). Trench lines should be plotted out before you begin digging French drains. You need to create your own mini-slope to carry the water down to its destination. A grade of 1% (that is, a drop of 1 foot for every 100 feet in length) is often recommended; others advise a drop of 6 inches for every 100 feet. Getting the water to go where you wish is essential for improving yard drainage; the grade will facilitate your efforts. So how do you measure the grading for a French drain? Pound two stakes into the ground to mark the beginning and end of the trench. Tie a string tightly to one of the stakes, then run it over to the other stake and tie it off there, too, but loosely (for now). Attach a string level to the string, adjusting the string to get it level. Once it is level, tighten the string at the second stake. Make sure the string is taut. Now begin digging the trench. As you dig, you will be able to measure down from the string to make sure that you are achieving the desired grade. Check yourself as you go. For instance, if the trench for the French drain is to be 100 feet long and the grade 1%, then by the time your trench is 50 feet long, it should be 6 inches deeper than where you began excavating. You will be digging a horizontal trench across the length of the slope. The digging is the most labor-intensive part of installing French drains. The trench will slope down toward the area where you have determined the water will be re-routed (if it does not quite reach that spot, you will have to dig a connecting ditch down to it). Trench width will depend on the magnitude of your moisture problem. Bigger moisture problems call for wider trenches. Small trenches are often dug to a width of 5-6 inches. 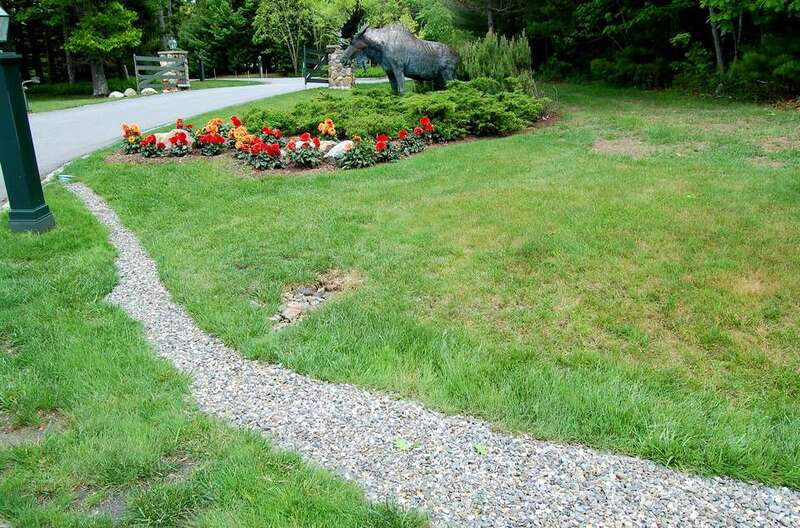 Before applying gravel, line the trench with landscape fabric. The landscape fabric will keep dirt out of the gravel. You want to preserve the porosity of the gravel, which promotes percolation of water through it. This is important, since percolation is one of the underlying principles that make covered French drains work. Shovel a coarse gravel onto the landscape fabric. Wrap the ends of the landscape fabric over the top of the gravel layer. You now essentially have a tube of landscape fabric filled with gravel. To fill in the rest of the trench, shovel in a layer of coarse sand, cover it with more landscape fabric, add 4 inches of topsoil, and lay sod on top. Your French drain is complete. If you do not think you can get the grading right for a French drain on your own (Step 3), hire a surveyor. Or simply hire a pro to do the whole job. If you are not inclined to dig the trench by hand, you could hire a backhoe operator. But that will jack up the cost for the French drain — not only for the digging, but for the extra gravel you will need (since a backhoe can't dig as small a trench as can a person wielding a spade). Another alternative is suggested by reader, Matt Fisher, noting that "many rental shops rent trenchers now. These machines cut very thin trenches...."
Bigger is not necessarily better. If you can get away with a small trench (Step 6) for your French drain, you will save money, as there will be less gravel needed to fill the trench. The most difficult problem in installing French drains can be figuring out where to channel the water. An "obvious" solution such as channeling the runoff toward the road (where the town's drainage system will take care of it) may not turn out to be viable once you research it further. Depending on your needs and tastes, building a dry creek bed may be an alternative to laying a French drain to address your drainage problem.